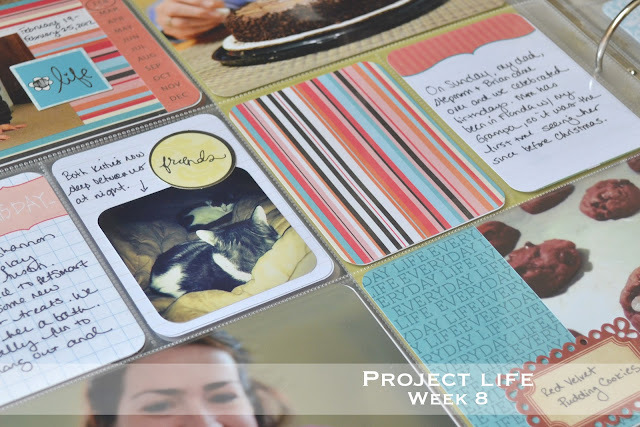 Welcome to Project Life Tuesday, Week Eight. It felt really, really good to take last week off from blogging. 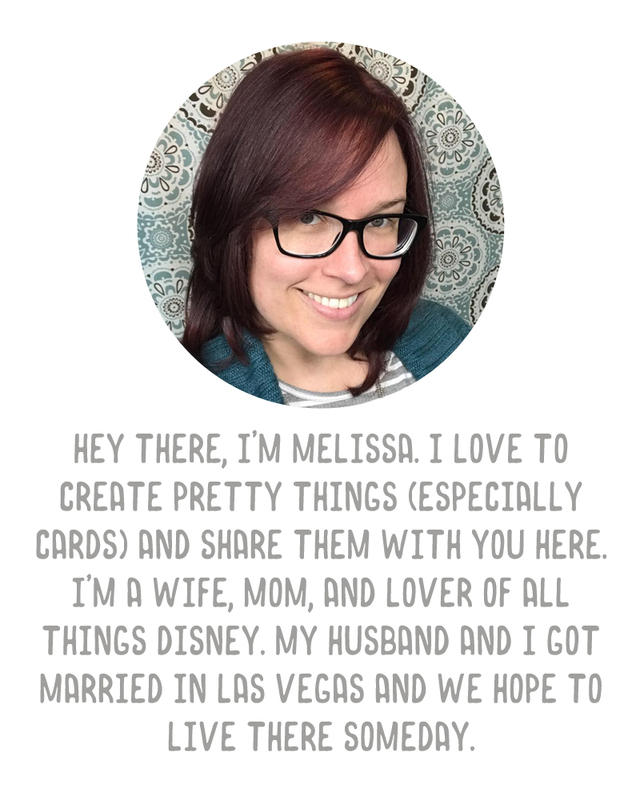 I spent a little more time with my family, a little more time crafting, and less time worrying about what to post and when. I expect to take more weeks off in the future, but I am excited to get back with some new stuff. It's funny, because Lindsay was over as I was pulling this together, and the whole time I kept telling her how much I was hating it. But now that it is complete and in my album with all my other weeks, I'm starting to dig it. This week I used a bunch of little embellishments from a Heidi Grace Designs punch paper pack I picked up months ago at Tuesday Morning. (Only $2.99 and I've gotten SO much out of it already!). The "life" tag on the title card, the "friends" tag on the cat picture, and the bunting flags tag were all from this set. I used a title card from the Clementine kit, but cut the months strip from an Amber card. 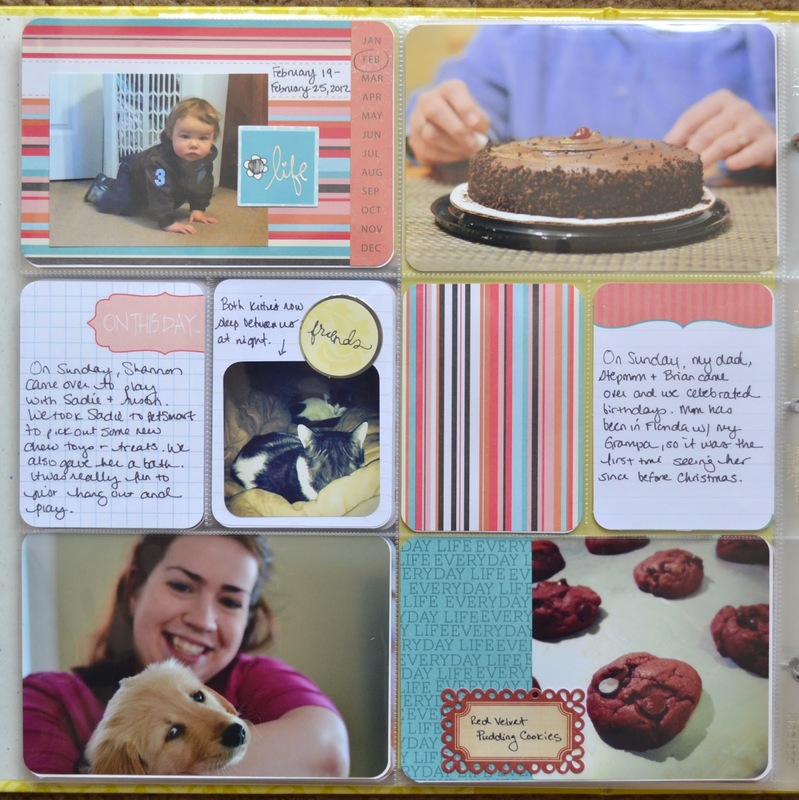 On this 4x6 journal card, I attached two pictures that I took from working on stuff for Austin's birthday party. I used some of the Clementine paper with an Instagram photo of the cookies Brad made last week. The tag is from K&Company's Wild Saffron Die-Cut Tags pack. 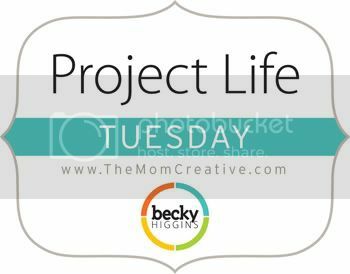 I wanted to note a few things that are working for me with Project Life this year. Printing my photos at Wallgreens. They're ready within the hour, and since Wallgreens is right down the street it's an easy pickup. Prints are 19 cents each, with no minimum (CVS charges $1.50 under $5). I upload my pictures either Saturday night or Sunday morning, and have them by Sunday afternoon so I can do my layouts. Setting aside Sunday evenings specifically to work on my layouts, and then photographing them Monday during the daytime (to get the natural lighting). I pull my post together Monday evening. 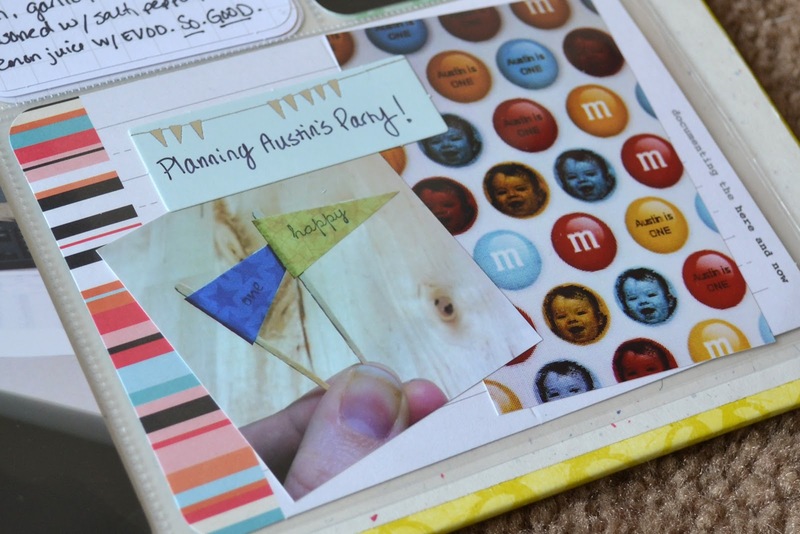 Using these printable templates from Marcy Penner. 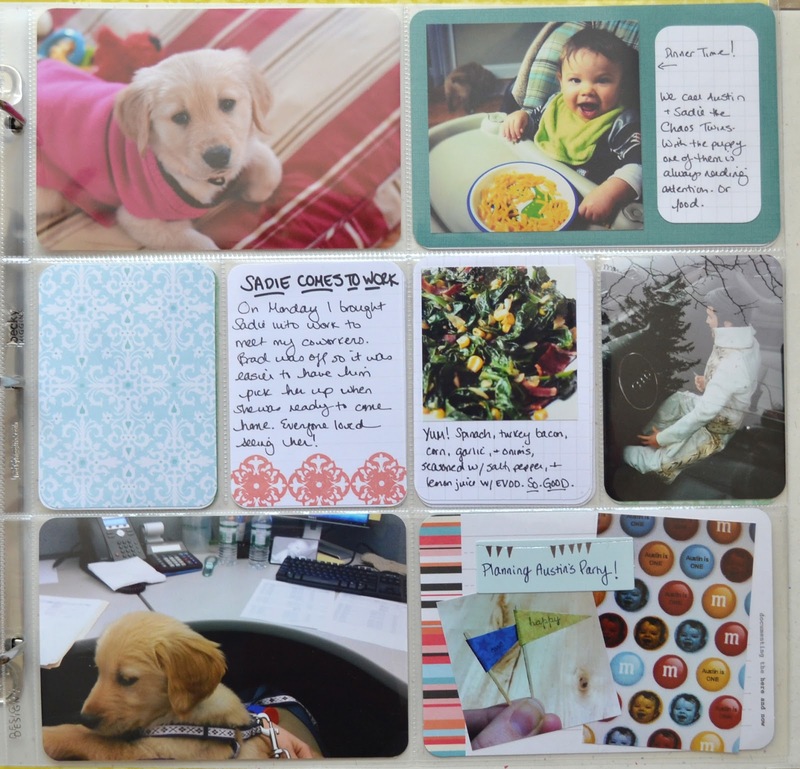 It makes it easy to note which photos I want to use where when deciding which to send to Wallgreens for printing. Using OhLife to record very quick notes about what occurred each day. 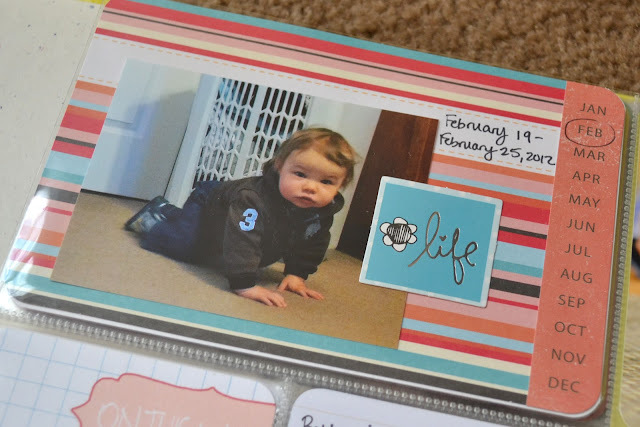 I just am not someone who can do my journaling during the week, so it is helpful to pull up OhLife on Sunday evenings and do all my journaling at once. Mixing the kits. I am finding myself a little bored with the Amber kit. While pretty, the colors are often just not what I'm looking for. Mixing the Clementine and Amber kits make me much happier. That's all for this week. Make sure you stop by The Mom Creative and check out everyone else's layouts! I love your style. It clean and simple, but with lots of fun bits and pieces added too. Very fun! Great job! 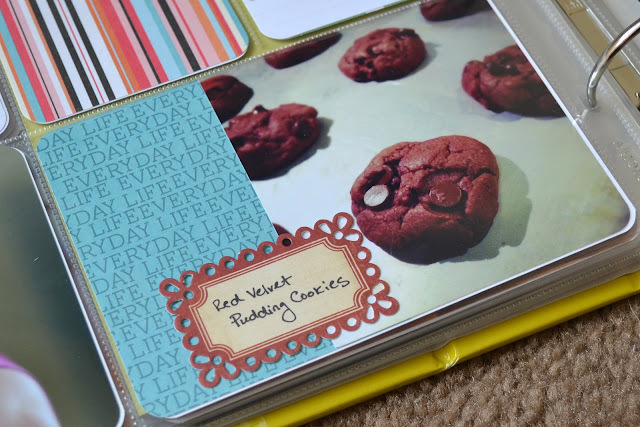 Those Red Velvet cookies look great! Good for you for taking some time off last week and focusing on what you needed to! I love planning parties. I really like how you included a party PLANNING picture. Love all the little embellishments and labels. Fab pages again! The cookies you sent home with me are so totally gone now! So delicious!! You'll have to send me the recipe! That cake looks yummy and that dog is just so dang cute! Love the m&m's. They turned out great! Poop! I forgot to get back to you about the party. It looks like a go (just have to confirm with John and the in-laws, trying to sneak in a visit). love the simplicity of it. I think it's true about "hating it"...for me when I sat down this week (week 9 now) i thought, "whoa I'm a little bit overwhelmed this week, did I document well, or I don't feel I took the right photos..." but then when I was done, I was in love with it all over again and not overwhelmed at all...yay. CUTE PUPPY! so sweet, best dogs ever! Keep Calm and Project Life on.